Try saying THAT ten times fast. Bobbyjudo made a video last week introducing the Japanese concept of “meibutsu”. Almost every town, city, village in Japan, has a “meibutsu” (名物) , something famous that they believe “defines them.” If you’re American, think of New York Cheesecake, or Australia’s Vegemite. It’s kind of like that, but on a wider scale. Absolutely everywhere, every little town, place, has a “meibutsu”, no matter how insignificant the town itself may be. But to be completely honest I’ve never really been a big fan of Okonomiyaki (I’m going to hell), partly because I’m not big into sauces or mayonnaise. Maybe I had a bit of a CANADIAN bias going on, but for me, the most exciting “meibutsu” of our trip was the Momiji Manju of Miyajima. Miyajima is known for its gorgeous scenery and in the fall, the Japanese Maple’s leaves turn bright red and yellow, and the Japanese go crazy for that kind of thing. Nature is beautiful right? Well as it turns out, nature is also marketable. Momiji Manju is a type of 和菓子, traditional Japanese sweet, that I can only describe as a maple-leaf-shaped pastry that’s filled with bean paste, custard cream, or sometimes cream cheese. 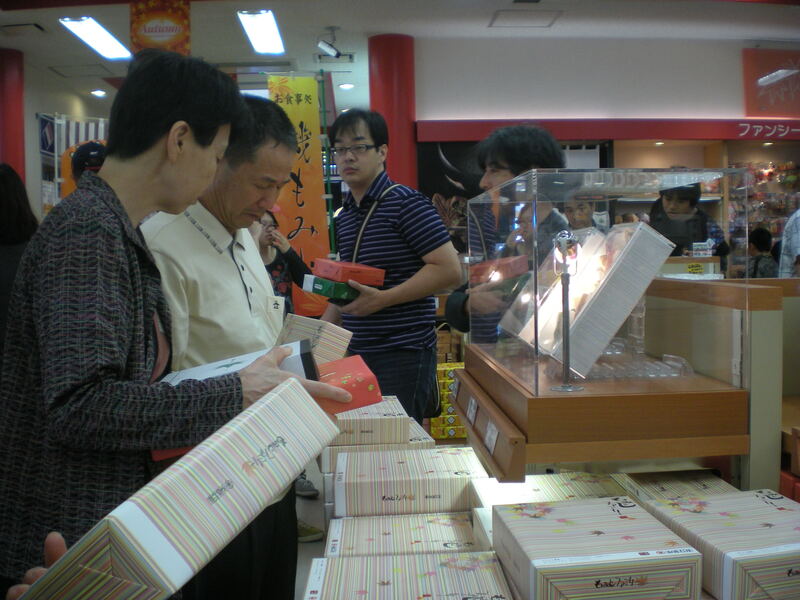 But the craze doesn’t stop there, you can buy Momiji Manju shaped plush toys, and even Momiji cheese cake, which is just regular cheese cake, with a maple leaf design on the top? Ryuhei and I made a point of trying Momiji Manju in several different locations in Miyajima. We tried deep-fried Momiji Manju at the Highway Service station in Miyajima, but it was dry and kind of unsatisfying. Our favorite, by far, was the Fujiya Cream Cheese Momiji Manju we bought on the island. Mine was filled with Blueberry Cream Cheese, and it was excellent. 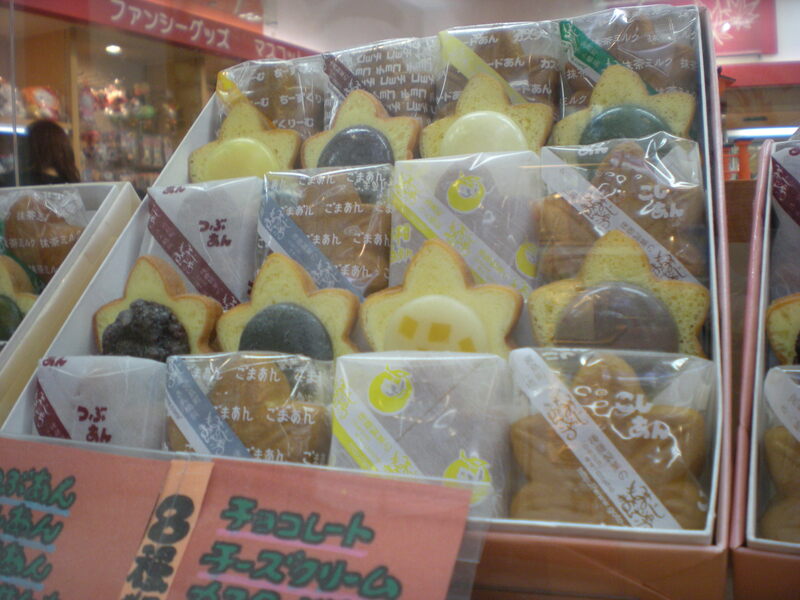 But what was particularly interesting to me, was the way that Momiji Manju is made. On the island of Miyajima, you have the opportunity to watch from the window, as a bunch of robotic arms methodically turn cake-batter into these delicious maple-shaped confections. Maybe I’m just dork, and get excited when machines do things that humans used to do, but I could have stood at this window and watched this process for hours. Although I’m sure that the employee, whose job was to place the filling in each manju manually, didn’t share my sentiment. Posted in UncategorizedTagged bobbyjudo, food, hiroshima, japan, japanese food, meibutsu, miyajima, travelBookmark the permalink. You know, I’ve always wondered how pastries like that were made. I could have watched that all day too! It’s so interesting. I have to say, you’re very good at writing. I always enjoy reading and watching things about your “adventures” in Japan ^_^ I hope to have some of those next year in Fukuoka! I love how you’ve started to write about “extra” stuff on this blog. 🙂 Thanks for sharing! what about monjyayaki? i cant imagine anyone not liking monjyayaki…. haha. I was completely the opposite. I LOVED the Hiroshima okonomiyaki, changed my life. =P Momiji Manju on the other hand.. didn’t really do it for me. Maybe I just didn’t spend enough time finding the one with the perfect filling. Sorry to say that your account and submitted article on JAPUNDIT were deleted accidentally. Could you please re-register on JAPUNDIT and post your article again? So very sorry for the mistake. Didn’t know that u’r writing a blog. 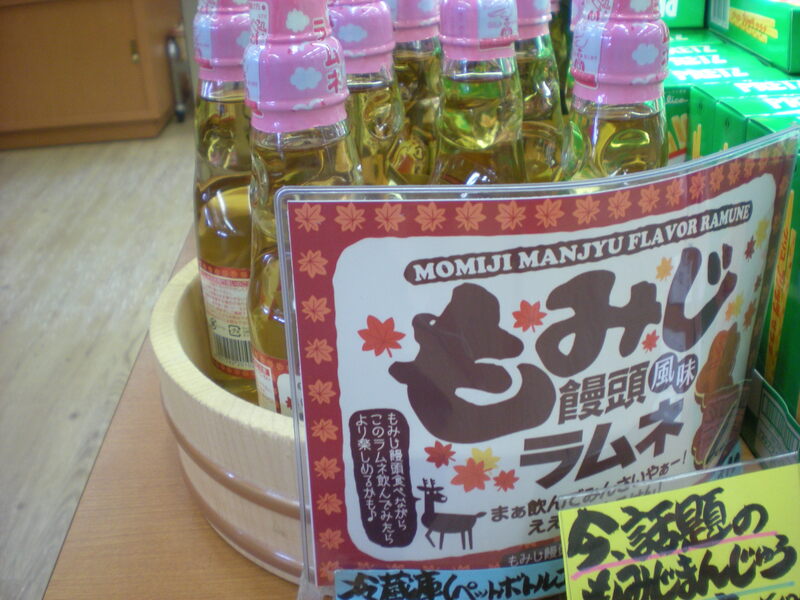 Good to see something interesting from u.
I love Momiji Manju. I haven’t had it for about 4-5 years and I can’t find the custard filled ones ANYWHERE in America. Where can I buy them?